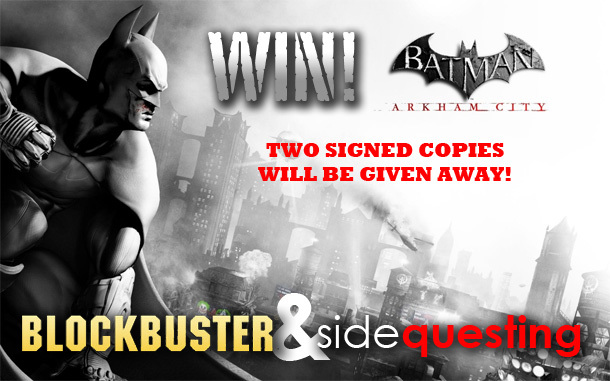 Blockbuster & SideQuesting bring you signed copies of Arkham City! We know you enjoyed our joint giveaway with Blockbuster for copies of Battlefield 3. We know that you rocked the Uncharted 3 giveaway (again with Blockbuster) so hard on Tuesday night that the internet slowed down. 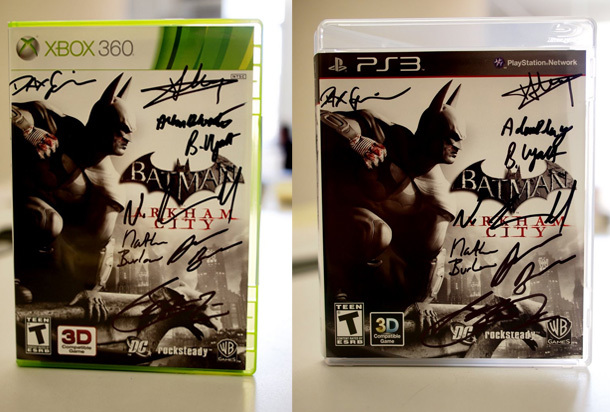 Well, we’ve spoken to the Joker, and he reluctantly gave us permission to give away these two INCREDIBLY AWESOME developer-signed copies of Batman: Arkham City! Our confidants over at Blockbuster have agreed to work with us to hold back the Joker’s anger, and are helping us supply this awesomesauce prize! They’re running an incredible promotion right now though November 22nd whereby if you purchase Batman: Arkham City from your local Blockbuster store, you’ll get a month’s worth of game & movie rentals for free! But there’s a catch: We can only hold back the Joker so much. We need your help! In order to fully activate the neural net around the Joker, we need to get this post to 200 entries in 7 days! We were able to get 125 in just two days with the Uncharted contest… surely we can stop the Joker and get to 200 in 7 days, right? And how do you win? Leave a comment, of course! In your comment, tell us what your favorite Batman villain is and why, and let us know which version of the game you’d like — Xbox 360 or PS3. That’s it! And you have 7 chances to win, too! Starting today (Wednesday, Nov 9th) and running through Tuesday Nov 15th at 11:59PM EDT Eastern (8:59PM PDT Pacific) leave your comment below. Open to US residents only. Special thanks to Blockbuster for providing the games! Please please PLEASE check out their promotion, which lasts through Nov 22nd, by clicking here! Every show of support helps us bring you great contests and prizes! Contest starts today (Wednesday, Nov 9th) and running through Tuesday Nov 15th at 11:59PM EDT Eastern (8:59PM PDT Pacific). Leave a comment on this post up to once per day, Wednesday through to Tuesday, for a total of 7 chances to win. Winners selected by SideQuesting on Wednesday morning, November 16th, around 12:00AM EDT.